See What’s New in C3! 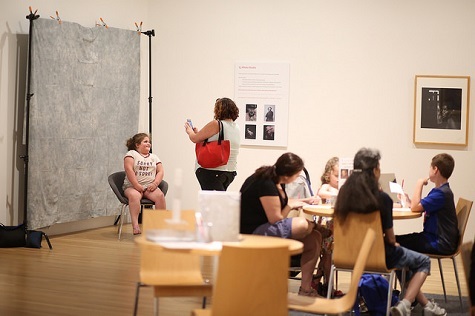 Sit at the drawing horses and sketch the portraits on view, take a seat at the table and try your hand at drawing a self-portrait or a portrait of a friend, or take turns being the artist in the Photo Studio and pose a friend for a photo portrait. Get inspired by these works of art designed for communication and create your own communication device. Fill out a label and display your device on the shelves at the C3 Art Spot. A Texas Dozen is a photographic portfolio by photographer, filmmaker, and journalist Geoff Winningham. From Dallas to Houston, Winningham captured the life and regional rituals of Texans in the early 1970s. These photographs tell a multitude of stories from events across the Lone Star State. Choose one photograph that catches your eye and write a story inspired by the characters and scene. Remember, the Center for Creative Connections is open anytime the DMA is open and is always free! Stop in, enjoy the art, and get creative. All ages welcome!